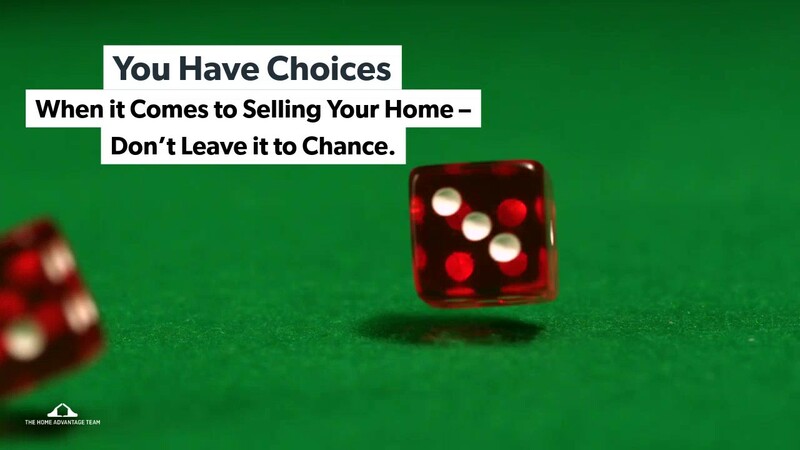 You Have Choices When it Comes to Selling Your Home – Don't Leave it to Chance. When you go to Vegas, it’s all about rolling the dice. You’re supposed to give it a shot, maybe you get lucky and come up with snake eyes. Maybe you don’t but that’s the name of the game and you go in with the mindset of taking a chance. But unlike Vegas, in real estate ‘the house’ doesn’t always win. The thing is, there’s nothing wrong with any of these answers. Staying put and renovating might be the best option for you if you love your neighborhood and your kids are in school. For Sale By Owner might work for you if you have a deep knowledge of the real estate process. Your friend’s cousin’s Realtor might be an excellent resource in their area. And not doing anything is fine if the timing is just not right. But the question is, how do you really know? How do weigh the cost/benefits to know which option is the best for you? Maybe staying put and renovating is going to cost you more than moving, cause more headaches, and you still don’t have everything on your wish list? For Sale By Owner seems like a great way to save on a real estate commission, until you realize you overpriced your home, missed some key contract negotiations and all of a sudden it’s costing more than that 5% commission. Your friend’s cousin’s Realtor is very successful in their town, but may not understand the housing stock, school systems and subtle nuances of the town you want to live in. Doing nothing is fine unless you’re not happy where you are and the situation isn’t going to get better any time soon. That’s why e) might be the best option of all. Choosing Steve McKenna & The Home Advantage Team means taking the guesswork out of the home selling process. If selling your home doesn’t seem like a good idea, we’ll let you know. If renovating is your best option, we have professional contacts to get that kitchen you’ve always wanted. And if you’re just not ready, we’ll be here when you are. Successfully selling homes in Arlington and the surrounding towns for more than 30 years has nothing to do with luck. Put your home in our hands and don’t leave selling your home to chance.